This 1965 Mustang arrived at Fast Lane Classic Cars last week. 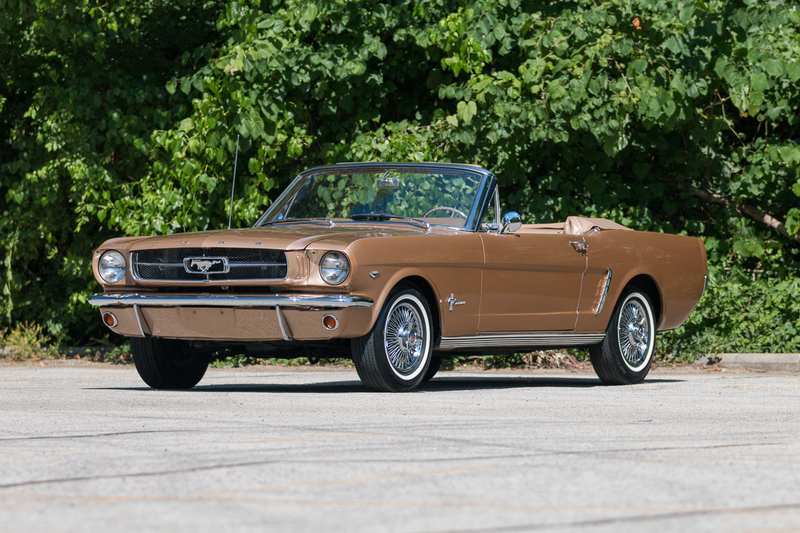 After a close inspection, our classic car experts verified this is one of the earliest Mustangs built during the 1964 model year, affectionately known by Mustang fans as a 1964½ Mustang. Officially, Ford never made a 1964½ Mustang. It is true that Ford started production of the Mustang during the middle of the 1964 model year, but the cars produced in early 1964 are officially designated for the 1965 model year. In the middle of 1964 Ford made some refinements to the Mustang design for Mustangs built in late 1964. This resulted in two slightly different designs for the 1965 Mustang. This is rather inconvenient for Mustang fans and car history buffs, thus, the legend of the 1964½ Mustang is born. At first glance, a 1964½ and a 1965 Mustang look the same. A closer look reveals more than a dozen subtle differences that set them apart! Here are three you can check for very easily. 1964½ Mustangs had their own engine lineup which used a generator charging system that required a large voltage regulator and cooling for the battery. The front side of the engine compartment of the earliest Mustangs includes three vents to cool the battery. Engines for later Mustangs used an alternator to charge the battery, so a smaller voltage regulator was used and the three vents to cool the battery were no longer necessary. Look for the three vents behind the grille on the passenger side for a quick I.D. on a 1964½ Mustang! The leading corner edges of the hood on most 1964½ Mustangs are unfinished. The process Ford used to stamp the Mustang's hoods in early 1964 left the leading edges unfinished, meaning the edge is straight and not "rolled over". Refinements to the Ford's stamping process allowed for finished edges on all sides of Mustang hoods for 1965 and later. If you look closely, you may be able to see this detail even if you aren't able to open the hood. Can’t get under the hood? Check the air vent knob under the dashboard! 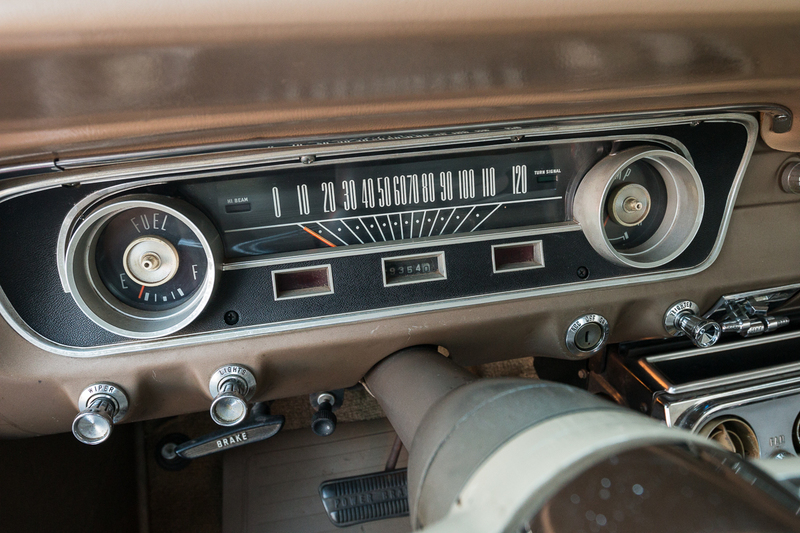 The vent knob under the dashboard is marked with an “A” on 1964½ Mustangs. It’s even on the left side of the steering column so may be able to catch a glimpse of it through a closed window. The printed “A” is removed on later Mustangs. Later Mustangs have the same knob with no printed "A"
There are several more obscure differences, such as the engine lineup, the size and placement of the horn, brand of the power steering pump and distributor, the material used to manufacture the water pump pulley, the location of the brake light switch, the color of the hood hinges and lock buttons, and the design of the carpet, taillight mount and spare tire mount. Have you found any other differences? Hit us up on social media @FastLaneSTL and let us know!